I’ve been looking high and low for great tips to share with you to make your life in the kitchen a little easier. 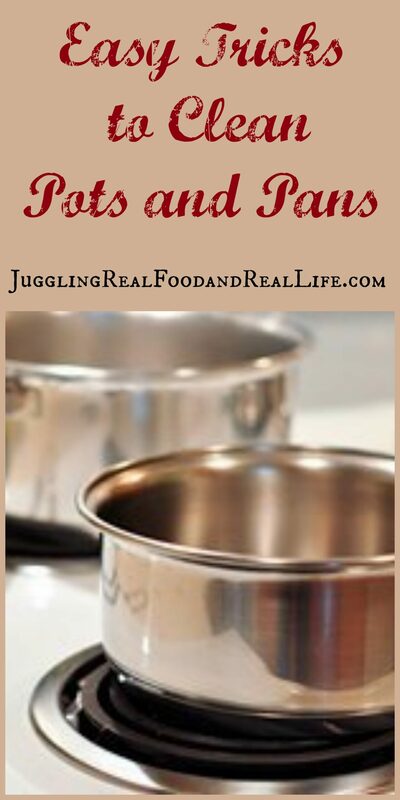 I’m excited to share this article which is jam-packed with great tricks to really get your pots and pans clean. I work really hard to get real food to the table for my family, but I’m often doing 20 things all at once. I’m helping with math homework, signing permission slips, doing laundry, and preparing the house for a Cub Scout meeting all while cooking dinner. Sometimes the Juggling doesn’t go as well as it should and I end up with pans that food burned on the bottom. Ever happen to you? I promise, I won’t tell anyone. That’s why I was glad that a friend of mine stopped by with these tips. I hope you find these cleaning tips as useful as I do. And maybe…..we will quit burning dinner. This article is contributed by a friend from DomesticCleaners NW6. She loves to write about cleaning and organizing. Seems like collecting grease and getting scorched is in pans and pots’ nature. The more you use them, the more frequently you would have to clean them up – otherwise they would collect so much grime that cleaning them would be an exercise in futility. But fret not! When you’ve got the necessary amount of knowledge, burned pans and pots’ clean-up is not such a nightmare! You don’t? Well, fortunately we do! Give those tips on an easy clean a go and they will do the trick, we promise. Hm, yes we’re well aware Alka Seltzer’s first and foremost application is that of pain and heartburn reliever. But you’d be surprised to see just how effective it is when it comes to cleaning your oven-proof pans and glass cookware. It would lift stains and help dissolve stuck-on food. And on top of everything, this trick is extremely quick and easy, not to mention cheap! All you have to do is fill the pan or pot with boiling hot water and toss in a few tablets of this effervescent. Let it sit for a while until the food and stains dissolve and then scrub them away. If your stainless steel pans are blackened and covered in burnt on food, there’s nothing easier than filling them up with tap water and turning up your hob’s heat to the maximum. Place the scorched pan on the hob and allow the water to come to a boil. Then wait for seven to ten minutes, take the pan off the hob and pour out the boiling water. But please be careful! Boiling water burns hurt like hell, leave scars and are very slow to heal. You will see the steam has gotten the job done. All burnt on food will come off with a simple swipe of a sponge. Your copper pots and pans have lost their shine and have become dull? No need to buy new ones as we are a hundred percent positive you’ve got some ketchup in your kitchen. The good news is you can use it to restore your old pots’ shine. Besides its much cheaper and perfectly safe for your skin – something which cannot be said about most polishing and cleaning products on the market. All you have to do is cover the surface of the pan or pot with a thin coating of this red sauce, let it sit for 20 to 30 minutes, wash the pan and you’re done. The secret lies in ketchup’s acids which are effective because they react with tarnish, forcing it to come off. These two are very effective when cleaning is concerned, as they can cope with almost everything from unpleasant odours to carpet stains. Turns out they can efficiently remove burnt on food and scorching from pans too! Who would have thought, huh? Cover the bottom of the pan with water, add several spoons of vinegar and bring to a boil. After a few minutes have passed, remove the pan from the hob and add two to three tea spoons of baking soda. Again wait for a while, then pour out the water and scour the bottom – all food and burn deposits should come out in a flash. When it comes to cleaning, table salt is also surprisingly multifunctional. However, it’s especially effective at removing burnt on milk from pot bottoms. That has to be the easiest way to remove stains from your pans and pots. You simply take the salt-shaker and sprinkle a good amount of salt at the bottom. Again allow it to sit for some time, then scrub and your pot will be as good as new. Another bonus of this method is that salt removes bad odour too! Instead of buying new pans and pots year after year, you should consider properly maintaining your old ones. This will save you a good amount of money in the long run. Besides, as you can plainly see, these tricks don’t require you buying anything that isn’t already in your kitchen. Don’t hesitate to give them a try and you’ll see no such thing as “uncleanable” pan exists. Have you tried any of these cleaning tricks? Have you found these methods of cleaning to be helpful? Would you like to see more tips and tricks like this here at Juggling Real Food and Real Life? These are really great tips! I very often use baking soda to clean dirty pots, the stoves or the oven. I like baking soda because it is very efficient, cheap and toxic-free. I haven’t considered using more natural ingredients for cleaning, but now I think that it isn’t a bad idea! Thank you for the post! 🙂 Greets!